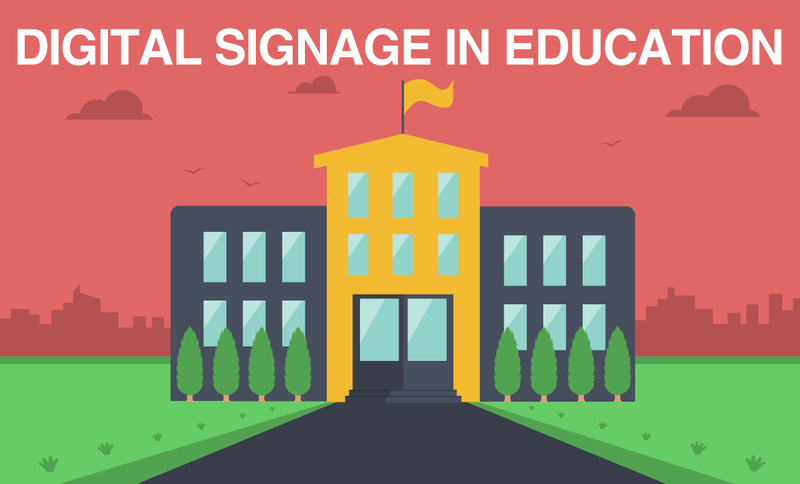 Over the past decade, digital signage has completely changed the way schools and educational institutions interact with their students, staff, and visitors. It’s introduced a new and exciting way for schools and colleges to reach their audience with engaging and targeted messages that actually get noticed. Digital signage is likely not going anywhere anytime soon, and if you haven’t already implemented it as a part of your communications strategy, you’re falling behind. "Digital signage is the most effective tool that you will use to communicate with your audience." Digital signage is the ability to show any type of media on a digital display. Digital signage is everywhere - the mall, restaurants, hospitals, universities, and lobbies. It’s a great tool for marketing a new product, promoting brand awareness, communicating with staff or students and engaging just about any audience in your space. Digital signage helps an organization communicate their goals, messages, and promotions in a way that is helpful to the target audience. It’s actually quite a nice way to introduce people to your brand or organization and to move on from outdated methods such as white boards, bulletin boards and flyers (which are likely not being noticed anyways). What are the benefits of digital signage in an educational environment? There are countless reasons that a school, college, or university may decide to ditch the paper and use digital signage as part of their strategy. Here are the top benefits that come with implementing a digital signage project in an educational setting. School administrators have to reach hundreds, or even thousands of pupils on a daily basis, and digital signage is the only effective method of doing so. Unlike static signs that often blend into the walls, educational institutions can tap into the dynamic world of digital signage by creating content that’s colorful and captivating, and will hold their younger audiences’ attention. As digital natives, students have come to expect digital forms of communication, and since they spend the majority of their time at school, it pays off to communicate with them in a way that’s meaningful to them. By providing valuable and timely content to students, administrators can cut through the clutter and improve lines of communication with their students. As long as you have the right content design and placement, both your staff and students will easily understand your messages and feel more connected as a community. Providing a safe and secure environment in which to study and work in is a top priority for any school or educational institution. Digital signage can easily be integrated with an emergency alert system that immediately communicates emergencies such as weather conditions and school closings. Digital signs can also communicate emergency contact information, emergency plans and safety guides, campus maps, and real time messages about what students should do in a certain situation. When paired with emergency alerts, digital signage allows schools to take an active role in promoting a safe campus, and is an efficient method to access campus safety resources, giving you peace of mind that you’ve taken the steps to create a secure campus environment. Universities and schools are always buzzing with events, and digital signage is a powerful medium to promote these events and provide your audience with useful and timely information they need. From job fairs, to formals, graduations, sports events, concerts, charity functions and other activities, you can use your digital signage to keep students updated and in the loop. You can also integrate your social media with your digital signage to let students stay in touch with photos and other updates from events. This will do a much better job of drawing attention to campus activities than what’s possible with a static sign. Besides the obvious savings in paper, printing, and distribution, digital signage in schools can also help to drive sales for school events and raise money. By increasing awareness of school events, digital signage can increase ticket sales for sporting and charity events. Donor walls can also be used to encourage alumni and parents to donate money. With the ability to schedule and update messaging in real time, digital signage is perfect for providing your audience with useful information. Whether its weather or traffic conditions, building closures, planned construction or bus route interruptions, digital signage is a *powerful* way to get these messages across in a timely manner. When it comes to campus communication, digital signage is the clear winner. As the most efficient method of spreading a message and streamlining communication, digital signage is essential to any school, college, or university. How can I use digital signage at my school? Digital signage allows you to centralize your communication in one place. Whether you chose to show daily lunch menus, student photos, or your morning announcements, you can effectively reach your students and get your message across. What’s the best location for my digital signage? The areas with the highest traffic often result in the best locations for installing digital signage. You will get the most from your investment if you showcase your announcements and updates in common areas, lobbies, or hallways where students walk and hang out. As a rule of thumb, it is best to position your digital signage at eye-height as this is where it’s most likely to be seen and interacted with. While ‘eye-height’ varies depending on the height of your audience, you can roughly estimate the average height of your audience and use this estimate to mount your displays accordingly. Today’s schools are filled with tech-savvy students and teachers, which makes digital signage a natural fit as a mainstay of their communications strategy. Digital signage gives administrators the ability to create messages and remotely control them to an unlimited number of displays, while also having the ability to update messages in real time. Schools like Texas State University, Wayne State University, and the University of Tampa are already using Rise Vision to power their digital signage and to connect with their students in an effective way. Get in touch with us to see how we can help you do the same!